Download a summary of our response to the Administration’s Blueprint. Policy solutions that lower drug prices for health plans and consumers, and reduce out-of-pocket costs are aligned with our goal of reducing health care costs and helping improve outcomes. Recently, President Donald Trump’s Administration released “American Patients First,” the President’s blueprint to lower drug prices. We see the impact rising drug costs have on plan members and patients every day. As a pharmacy innovation company that is helping people on their path to better health, we support the Administration’s goal to lower drug prices and reduce out-of-pocket (OOP) costs for consumers. We are using every innovative tool possible to bring down the cost of drugs ourselves. CVS Health submitted a response to the Administration’s blueprint, highlighting what we, as a company, do to help bring down drug costs and steps the government could consider. Our pharmacists witness the sticker shock firsthand as patients question the cost of brand-name drugs, especially considering prices have grown 10 times faster than inflation over the last five years.https://www.hsgac.senate.gov/media/minority-media/breaking-brand-name-drugs-increasing-at-10x-cost-of-inflation-mccaskill-report-finds. And until drug manufacturers reduce the high prices they set for these drugs, we know this problem is not going away. CVS Health’s pharmacy benefit manager (PBM), CVS Caremark, negotiates the lowest possible cost from drug manufacturers for our clients, and ultimately, for the millions of Americans who pick up their prescriptions at pharmacy counters every day. The tools used by PBMs to remove drug costs from the health care system are projected to save $654 billion over the next decade.Visante Inc., “Pharmacy Benefit Managers (PBMs): Generating Savings for Plan Sponsors and Consumers,” Prepared for PCMA, February 2016, https://www.pcmanet.org/wp-content/uploads/2016/08/visante-pbm-savings-feb-2016.pdf. CVS Health provides availability of rebates at the point of sale as an option for all clients. 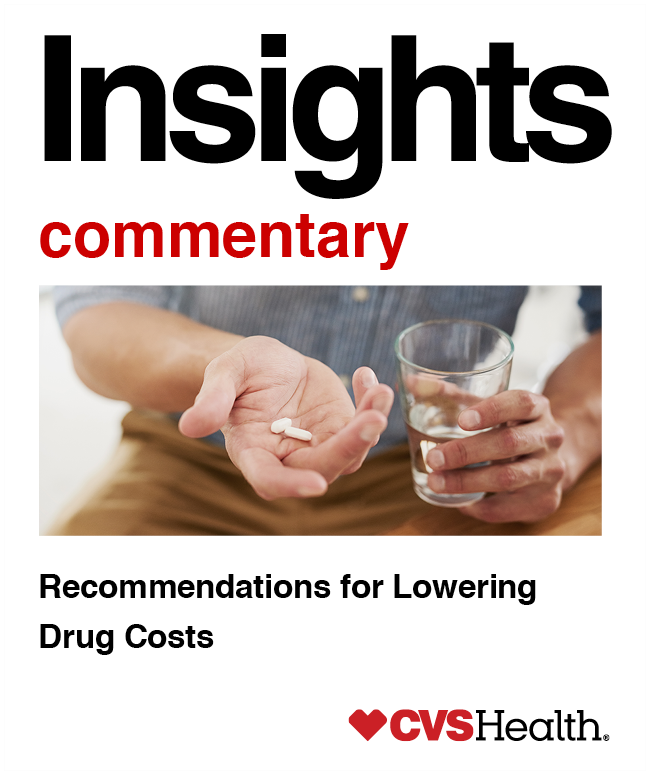 In addition to helping consumers reduce OOP costs, this approach leads to greater transparency in drug prices, and unquestionably demonstrates the true cause of rising drug costs for consumers, which is the price set by pharmaceutical manufacturers. For consumers in high deductible health plans (HDHPs), the availability of point-of-sale rebates on their medications before their deductible is met, can be a key solution to help consumers stay adherent on their essential medications by making them affordable. We are using an innovative technology solution to bring real-time benefits information to the point of prescribing. Through their electronic health records system, prescribers are able to see the member-specific cost for a selected drug, based on a beneficiary’s coverage, along with up to five lowest-cost, clinically appropriate therapeutic alternatives. We have also brought this technology to the pharmacy counter. Our nearly 30,000 pharmacists utilize the Rx Savings Finder tool to quickly identify available savings opportunities when members present their prescriptions. This tool is expected to produce an average of $420 in additional annual savings for the patient.CVS Health Enterprise Analytics, 2018. Our pharmacists are committed to helping patients find the most affordable options, and we ensure that pharmacists in our CVS Caremark networks do the same. Accordingly, CVS Health does not engage in gag clauses, and we support efforts to ban them. Chronic Condition Drug Lists: With more Americans now covered through a HDHP with an associated health savings account (HSA), millions of consumers are seeing higher OOP costs on the part of the benefit they use most — their prescription drug coverage, because they often do not have full prescription coverage until they have met their deductible. Current Internal Revenue Service guidance for HSAs only allows certain preventive products and services to be covered by a HDHP prior to a patient meeting their deductible. Expanding coverage of preventive products and services to include products for managing chronic conditions, or allowing a HDHP to cover drugs prior to satisfaction of the deductible would help these plans provide first-dollar coverage at the pharmacy counter, improve adherence and health outcomes, and reduce sticker shock when consumers fill their prescriptions. This can be accomplished immediately through the regulatory or guidance process. Real-Time Benefits: We have seen great results from prescribers accessing real-time benefits information at the point of prescribing. Through the electronic health records system, providers are able to see the member-specific cost for a selected drug, based on where the member is in their deductible, and up to five lowest-cost clinically appropriate therapeutic alternatives specific to the member’s formulary. For prescriptions written by physicians using real-time benefit information, which are filled by the member, when a lower-cost preferred alternative is presented, physicians are switching to the lower-cost alternative 40 percent of the time. In these cases the member cost was $130 lower per fill, compared to the original non-preferred drug selected.CVS Health Enterprise Analytics, 2018. Physicians are switching to a covered drug 75 percent of the time when the original drug is not covered. We recommend the Administration use every regulatory tool to incentivize the adoption of point-of-prescribing real-time benefit information to help save patients money. Greater Competition: More must be done to make generics available, including expanding the use of biosimilars, and eliminating tactics that stall competition. To increase the availability of biosimilars, the Administration should support shortening the exclusivity period for biologics from 12 to seven years, and finalize interchangeability guidance, which is key to expanding adoption of these lower-cost alternatives. By prohibiting pay-for-delay agreements, the Administration can curb anti-competitive practices and help bring lower-cost, clinically equivalent generic medications to market more quickly. CVS Health also firmly supports the bipartisan Creating and Restoring Equal Access to Equivalent Samples (CREATES) Act to stop the abuse of Risk Evaluation and Mitigation Strategies, which costs the health care system $5.4 billion annually by keeping generics from entering the market, and encourage the Administration to do the same.http://www.gphaonline.org/media/cms/REMS_Studyfinal_July2014.pdf. Allowing Medicare Part D to Negotiate Pricing: Strengthen negotiating tools in Medicare Part D, including by providing greater formulary flexibility, which will help build upon the program’s successful record of delivering affordable drug benefits to seniors at a cost far less than originally projected. Savings will vary based upon a variety of factors including things such as plan design, demographics and programs implemented by the plan. This document contains trademarks or registered trademarks of CVS Pharmacy, Inc. and/or one of its affiliates.